Demand for Indiana medical assistants is high, with a projected growth rate just under the national average of 29 percent from 2012-2022, according to Projections Central. In addition, medical assistants in the state earn competitive salaries and have the opportunity to attend yearly professional organization conferences, such as a conference held each spring for the past 60 years by the Indiana Society of Medical Assistants (ISMA). Community colleges and vocational schools offer medical assisting programs in the Hoosier State. If embarking on a career in a growing field sounds like a good path, find out what’s required to become one of the many successful medical assistants in Indiana, including education, certification and important skills required. Finding a job in medical assisting can be as simple as earning a degree or certificate in the field. It’s an opportunity to learn about best practices in patient care, how to run a physician’s office or health care facility and work hand-in-hand with insurance companies. But finding the right medical assisting program can be a challenge since each school offers different resources for students. 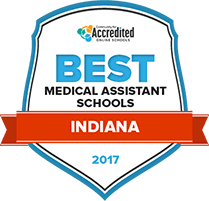 We’ve done the hard work for you and identified the top school for medical assisting in Indiana for 2017, based on class sizes, student programs and the availability of specialties. Check out the top school below. It is projected that more than 600 medical assisting job opportunities will open annually through 2020, so Ivy Tech Community College has put special effort into developing a medical assisting program that will help make graduates qualified applicants for these positions. Ivy Tech has partnered with several other institutions of higher education to develop transfer agreements, allowing students to move between institutions if the need may arise. Students at Ivy Tech may complete their coursework in whichever format is most beneficial for them, whether it's traditional in class sessions, online learning, or evening courses. Indiana medical assisting school Ivy Tech Community College may meet your specific needs and interests – while staying within your budget. Find out more about its offered associate degree and certificate program. Prepares students to sit for the Certified Medical Assistant (CMA) certification exam through the Association of Medical Assistants (AAMA). Students participate in a community externship. The program is taught by credentialed professionals who have real experience in the field. How does Indiana define "medical assistant?" Under Indiana's state law, medical assistants are considered non-licensed personnel who are permitted to perform specific administrative and clinical duties including administering medication under the supervision and direction of a physician. In addition, Indiana medical assistants are required to report the results of any physical exam to their supervising physician. Do medical assistants in Indiana have to be certified? Certification is not a requirement for medical assistants in Indiana. However, becoming certified is one way medical assistants can stand out from the competition when seeking employment because of the comprehensive training involved in preparing for the certification exam. Does a medical assistant need formal education and/or training in Indiana? A formal education or training is not required for medical assisting in Indiana. However, assistants may only perform tasks delegated by a supervising licensed physician. Formal education and training is available at accredited post-secondary institutions to formally prepare medical assistants for the workforce. What clinical and administrative skills do students learn in a formal medical assisting program? Are there tasks outside the scope of medical assistants in Indiana? Indiana medical assistants may not diagnose a patient or prescribe treatment at any time. In Indiana, salaries for medical assistant can vary widely depending on geographical location, illustrated by BLS 2014 wage amounts shown below. Medical assistants in the Indianapolis area earn the highest salaries while those in Fort Wayne earn considerably less. The projected growth rate for medical assisting jobs in Indiana is just under that of the national average at 28.8 percent. The high demand for medical assistants is due largely in part to the aging baby-boom population and increased health insurance access in the U.S. Medical support personnel is needed to perform basic administrative and clinical duties so physicians can spend more time with patients and see as many patients as possible. Compare projected job growth for Indiana medical assistants and their national counterparts with the table below. AAMA is a membership organization providing education, certification, credential acknowledgment, and networking opportunities to medical assistants around the country, including those in Indiana. AAMA defines advanced medical assisting skills and areas of knowledge in this document to help medical assistants in Indiana and other states better understand which continuing education opportunities to pursue. American Medical Technologists (AMT) offers this article about state laws affecting the authority of physicians to delegate clinical tasks to medical assistants in several states, including Indiana. This membership organization is an affiliate of the AAMA that provides leadership, events, and access to forms for medical assistants in Indiana. Find salaries for medical assisting jobs in Indiana and search job listings.